Sanderling Healthcare, LLC benefits from the deep experience of its leadership team. Dr. Tannenbaum holds an M.D. from Vanderbilt University School of Medicine and a Ph.D. in Pharmacology from Vanderbilt University School of Graduate Studies. He completed his training in Internal Medicine at the Jewish Hospital of St. Louis and his Nephrology training at Barnes Hospital, both affiliates of Washington University of St. Louis School of Medicine. He is Board Certified in Internal Medicine and Nephrology and is a Fellow of the American College of Physicians (FACP). He was the founder of REN Corporation-USA (formerly NASDAQ: RENL), a publicly traded provider of dialysis services, where he served as President, Chairman and Chief Executive Officer from 1987 to 1993. In 1993, he founded Medical Information Management Systems, Inc. (MIMS), a medical software company and developer of the robust PEARL EMR system. In 1998, Dr. Tannenbaum became Chairman and Chief Executive Officer of National Nephrology Associates, Inc. (NNA), a nationwide dialysis services provider that he co-founded with some of his original management team from REN. Dr. Tannenbaum left NNA in June 2003 to co-found Diversified Specialty Institutes, Inc. (DSI) with Dr. G. Patrick Maxwell, and certain former members of the NNA, MIMS, and REN management teams. In 2005, Dr. Tannenbaum led the formation and expansion of DSI Renal, Inc. (an affiliate of DSI), a company that operates over 120 dialysis centers across 26 states, and served as its Chairman and Chief Executive Officer. 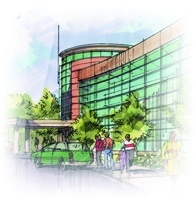 In late 2008, Dr. Tannenbaum left DSI Renal in order to found Sanderling Healthcare, LLC, to commercialize his pre-engineered construction methodology for hospitals and other healthcare facilities. Mrs. Tannenbaum graduated from Vanderbilt University and pursued her MBA studies at University of Tennessee. She worked in the graphic arts industry prior to joining Shearson/American Express where she served as an investment counselor. She spent over 22 years with Bank of America prior to serving as a principal with a private trust company. Mrs. Tannenbaum joined Sanderling Healthcare in 2010 as the Director of Business Development and Client Relations.